Raised in Indiana, lives in Simpsonville, KY and first got involved by invitation from Via Colori Kentucky event planner. This is my 3rd year participating in Chalk Festivals and my first event of 2018. I work in a machine shop for a living, so chalking is a fun outdoor hobby and an outlet for my creative mind. If I could do anything in this world, it would be sculpting! Or, computer animation modeling. 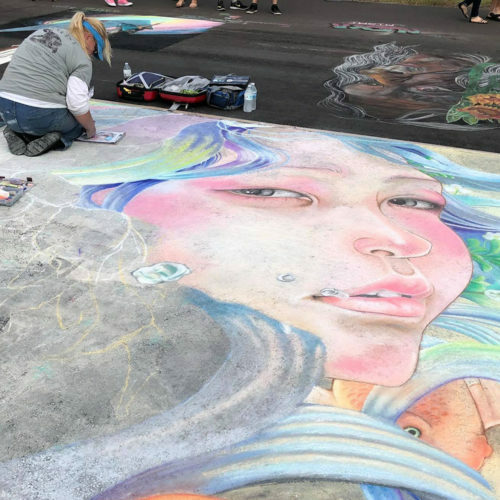 Chalktoberfest, Bloom-n-Chalk Featival, Via Colori Kentucky, Arbor Lakes Chalk Festival, Denver Chalk Featival, Nashville Chalk Festival, Venice, FL Chalk Featival, Lake Worth Chalk Featival.